Last week I was in it for the long haul – for fifteen long and enduring hours. I always (and I mean, always) book an aisle seat and this flight was certainly no exception (but really, there are no exceptions). I made myself comfy, sleeping mask at the ready, and prepared for a long journey home. Two seats sat between my own and the window. A gentleman and his colleague were to occupy them and before they even sat down, I knew they would soon prove to be trying neighbours; he was already clearly displeased with his seat pre-takeoff. It took three hours of flight into the airspace above the South Pacific before finally they outwardly suggested that I swap for the window seat because the one who was now there “couldn’t sleep.” As you can imagine, I wasn’t going anywhere; I planned in advance for this. The bothered gentleman remained worked up about his whole window seat situation, enough to make it known to all of us around him that he’d be “renegotiating his contract with his boss.” (Tsk sounds included.) I wanted to share my “How to Sleep on an Airplane” tip list with him but in all honesty, I was too tired by this point and he wouldn’t have been receptive anyways. There are times it is best to stay quiet. We’ve all been there – cranky as can be, under-slept, and caught in our own bubble. To avoid getting to the point where our own personal drama is made everyone else’s problem, here are those tips I would have shared. We might find we have too much time to kill in the airport before boarding and might naturally spend half of it in line at Starbucks. 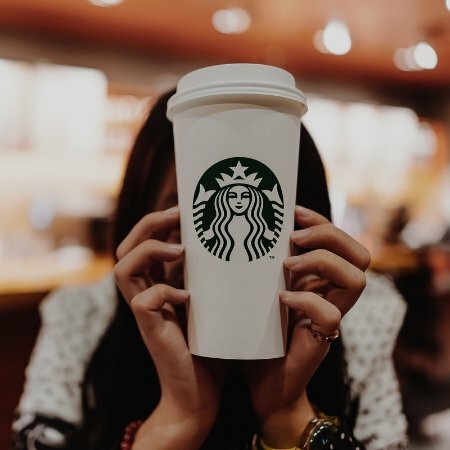 If you’re looking to sleep through your flight, you might want to avoid this caffeine-kick. The surge of it in your system won’t help you catch any z’s on the journey ahead. Go for herbal teas or water instead and enjoy your cup of java when you arrive. These two simple comforts will be your friends, seriously. A neck pillow will help to support your head and neck during sleep (a chunky, rolled-up sweater might suffice otherwise) and the sleeping mask will help to cut out cabin lights, signaling to your body that it’s time to rest. Yes, it’s not my personal preference, and it might not be yours. But honestly, if you end up in a window seat you have a hidden advantage of an extra place to rest your head. Nestling up in that little spot between the aircraft cabin and your headrest can be surprisingly comfortable, although you might want a blanket or sweater to fill the small gap (it’s usually a bigger gap if you’re right beside the window rather than the wall). Don’t worry about where you’ve been; think about where you’re going. Trying to negotiate with yourself about whatever time it might be wherever you are above the ocean is not going to help – that mental frenzy is only going to leave you stressed out. Breathe deep and pre-adjust yourself to the time zone you’ll soon be reaching. We can support the body to fall asleep naturally by using a combination of supplements that help to soothe anxiety and relax the mind. 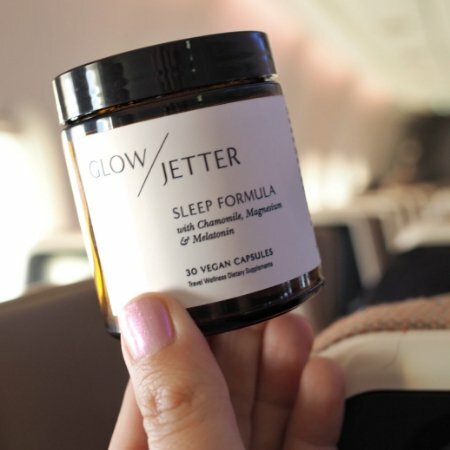 GlowJetter’s Sleep Formula contains a powerful blend of chamomile, passionflower, magnesium, and melatonin to promote a deep sleep through those lengthy hauls. Hands down, the best way to sleep on an airplane is to be prepared. Book your seat in advance, bring some comfort items, and try to tune out mental chatter and overhead lights. Add a soothing supplement and you’re likely to catch more z’s than your neighbor. It pays to plan.